Thumbprint Cookies are perfect for the Christmas holiday season. Filled with sparkling red raspberry jam they add a festive look to any holiday tray. But don’t limit yourself to the holidays, cookies can be made and eaten any time of year (trust me on that one). Anyone can learn to bake gluten free cookies. It can be tricky and it is certainly disappointing when a recipe doesn’t turn out. But if you like cookies as much as I do then I encourage you to persevere. Get yourself four or five cookie recipes that work for you. Over time you will try new ones but just get a few that work perfectly. During the Christmas baking season I like to make my tried and true cookie and bar recipes and I also like to try something new. This year these gluten free thumbprint cookies are new for me. 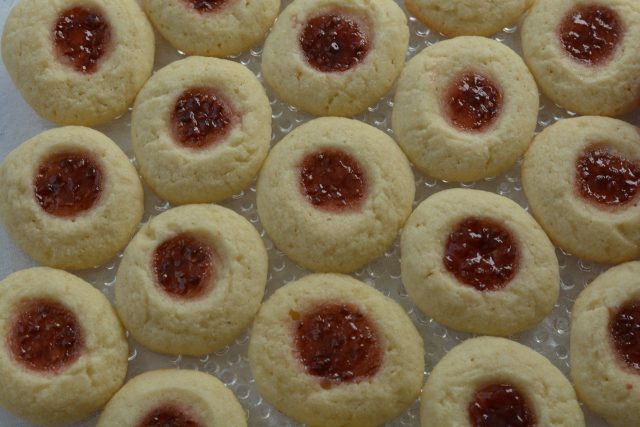 As you may have guessed the little indent in the cookies can be made with your thumb…thus the name thumbprint cookies. If your thumb is too big like mine just look around the kitchen and find a small spoon, scoop or tiny glass to make the indent. For variety you can fill the indent with different jams or jellies. Blueberry, raspberry, apricot and pineapple would create an interesting tray of cookies and vary the taste. For a change from the usual round tray try serving them on a rectangular shaped tray or even a cookie sheet lined with paper napkins, waxed paper or parchment. For an extra fancy presentation use a tiny strainer to sprinkle icing sugar over the entire tray of cookies. Baking homemade cookies is a skill I think everyone should learn. The satisfaction of making cookies and the joy of eating them fresh from the oven…now that is worth the effort. For kids who eat gluten free hosting their own Cookie Decorating Party is a fun idea. Many of my pans are more than ten and twenty years old. It takes time to collect good quality pans but is worth the effort in the long run. Just pay attention to the pans and sizes that you like and work well for you. I suggest you work toward a collection like this so you can bake items like cookies, brownies, muffins and the occasional cake. Some of them can be used for savoury dishes too. Let me know in the comments below if you have a trick you learned about baking gluten free cookies. Thanks to Luane Kohnke for this recipe from her book Gluten Free Cookies. In a medium bowl combine brown rice flour, tapioca starch, xanthan gum, baking powder, salt and almond flour. Sift potato starch on top of the mixture. Whisk all until evenly combined. Set aside. Put butter and sugar in large bowl of an electric mixer and beat on high speed until fluffy, 3-4 minutes. Add egg and vanilla, beat until evenly combined. Decrease speed to low and slowly add flour mixture beating until combined. Cover and refrigerate 1-2 hours to chill the dough. This can be made 1-2 days in advance. Using a small scoop drop 1-inch balls of dough onto cookie sheet. Roll each ball in your hand to make the sides smooth. Make a dent in the middle of each cookie using your thumb or a small, rounded spoon. Fill each dent with jam. Bake for 12-14 minutes until the edges of the cookie just begin to brown.